are not that well known. With their old style cone tweeter but a modern small size, they can be considered a link between the 1960s and 70s. The small power handling capacity probably was to be blamed for their demise though, as most receivers introduced in the early '70s already well exceeded the rated power. These aren't the speakers to use at a party, but at moderate volume they produce a very pleasing warm sound especially with acoustic music. The cone tweeter however makes them highly directional, so they are best used in set-ups where you can direct them straight at the preferred listening position. Beovox 2200 bass drivers have rubber roll edges, so there is no need to worry about foam rot. If the speakers sound fine with all drivers working, they should be a safe buy even without further investigation. The frets, constructed on a wood/metal frame, are however easy to carefully pry off for inspection. 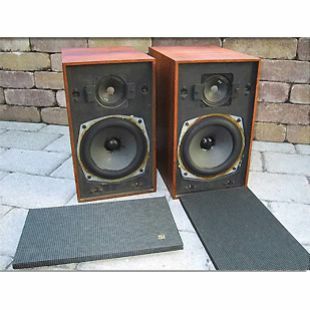 to complete a vintage set-up with a contemporary Beomaster 900M, for example. 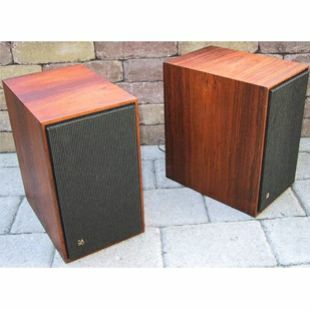 Speaker units: low frequency unit and high frequency unit. Crossover frequency: 5 000 Hz. Frequency response: (DIN 45570) 50 - 18 000 Hz. Power rating: 10W (RMS), 15W (music), Volume 7.5 litres.